A high-gloss finish always looks fresh in the kitchen. 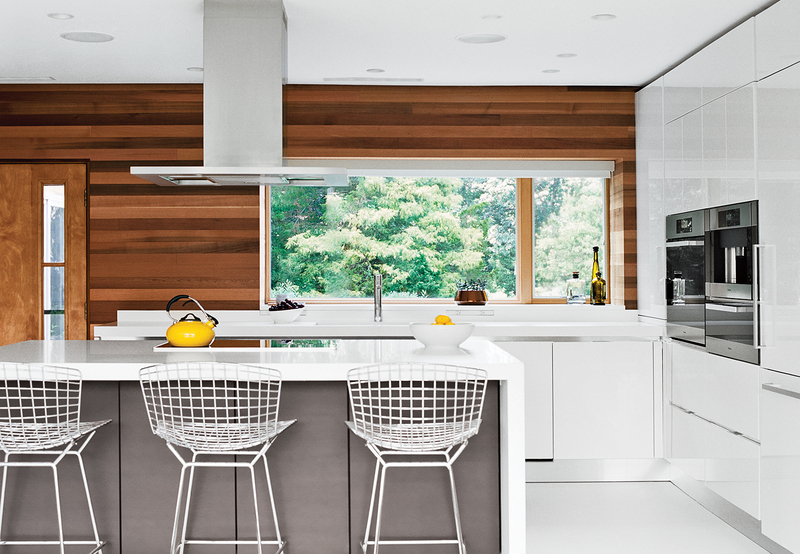 In this renovated Hudson Valley home, Bertoia bar stools by Knoll are tucked under the island in the white-lacquer Scavolini Scenery kitchen. Fernando Franco of floor specialists Garage and Beyond replaced the original wood flooring with white resin, a robust surface used in high-traffic environments. In an apartment building in central Madrid, Estudio Untercio designed the medium-density fiberboard cupboards, which are coated with lacquer paint matching the ceramic-porcelain countertops. A glossy orange accents the black cabinetry. The tubular hood above the island is by Teka. A Spanish-style San Diego home was transformed into a modern loft-like oasis, where raw polished concrete floors and diamond-plate steel cladding on the floating staircase add a bit of shine underfoot. At Eero Saarinen's legendary Miller House in Columbus, Indiana, mosaic tile wall softens the laboratory-like effect of the glossy kitchen cabinets. In an art-filled Hamptons home, the living room fireplace gets reflective when tiled with military-issue dog tags.